There is Nothing That Will Increase Your Homes Equity Like a Kitchen! Kitchens can cost $30,000 and up to replace, but with Kitchen Renew and More you can get a renewed kitchen for as low as $2500, but increase your home’s equity as if it was a brand new kitchen! The kitchen is the heart of a home—people gather and spend a lot of time there, so renovations that improve the kitchen are a good idea. Adding living space—either by finishing an unused basement or putting an addition on your home is the second most popular reason to renovate. Check out this visual aid showing return on investment. 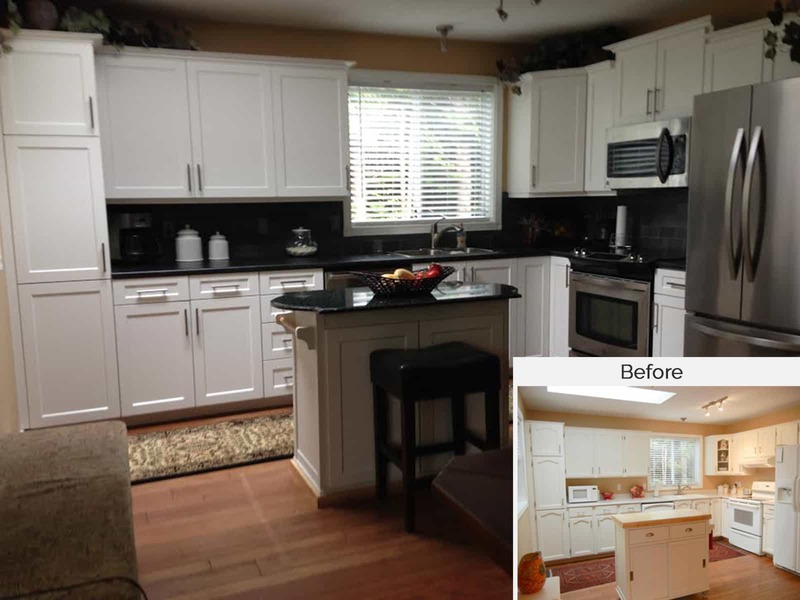 It is in USD, so a minor kitchen renovation will increase your home by an average of $20,000! Increase Your Homes Value – One of the best places to put your money when renovating is the kitchen, according to Mike Holmes from HGTV. This is when you’re paying full price to get your kitchen renovated, think about the rate of increase in value when you’re paying 1/10th of the price! Want to eat healthier? – Having a beautiful kitchen will increase your chances of cooking a good old home cooked meal! Have an investment property? – When you upgrade your kitchen you get noticed by potential renters far more often… and in a good way! This gives you the possibilities to; increase rent, decrease vacancy, more applicants, and more higher end renters. We can make even the smallest kitchens shine. A typical kitchen reface can take between 24-72 hours, so you can enjoy your kitchen fast! We simply set up a time that works for you to take the measurements, we then return at a later time and the magic happens. Where Can I Buy Pull Out Cabinet Shelves? Our pull out cabinet shelves are 100% handcrafted, 100% custom made, and 100% quality. Kitchen Renew and More can design a custom made pull out cabinet shelf to fit your kitchen needs TODAY with a FREE design consultation.